This program is used to give the programmer and ISIS programs a database with which they can reference coverage times for ck and spk kernels. Output will thus be to a pvl file specified in the TO parameter. It should be noted that the user is encouraged to use system preferences when defining pathnames, for example $mgs or $base. If this is not possible, for example kernels are being referenced that are located in a user's development area, absolute pathnames should be used. Relative pathnames using ". ", "..", or user-defined environment variables are highly discouraged. Kernels have different qualities. The lowest quality is nadir, which supplies what may be considered "placeholder" values. Generally, nadir kernels exist to fill in gaps and mimic the instrument pointing at -90 degrees. Since they only mimic pointing data, they cannot be used for SPKs, since these kernels specify positions rather than pointing. The second lowest quality kernel is predict. Predict kernels are based on the predicted location of spacecraft and thus are subject to error. Reconstructed kernels are of higher quality than predicts. They are supplemented with information as to the actual position of bodies and spacecraft. The highest quality kernels are smithed. These generally come from reconstructed kernels that have been corrected even further by an individual institution. 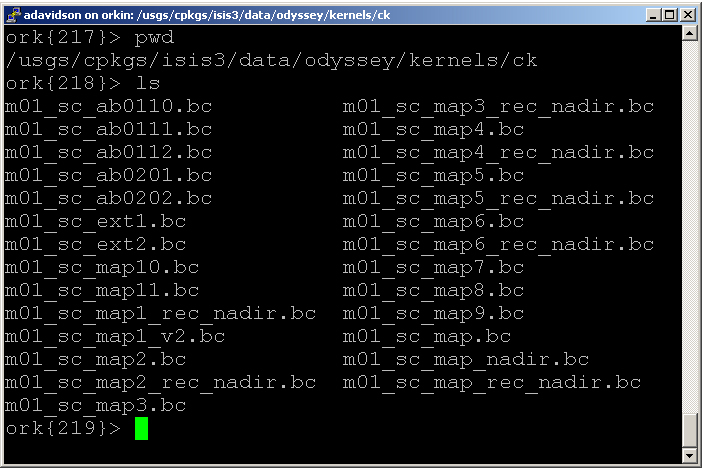 The four levels of kernels listed above are the only ones that will be listed in the database. Kernels are ordered from the lowest quality at the top of the output file to the highest quality at the bottom of the output file within individual kernel qualities, kernels are listed from earliest to latest created file. 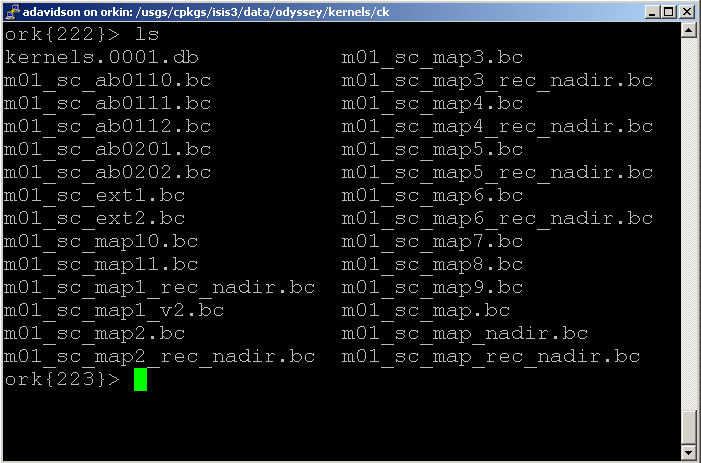 This is done in anticipation of programs such as spiceinit which read from the bottom of the file for the best kernel. This program's database is in pvl format, and as such order is significant. The last listed kernel file covering the timespan will be used. 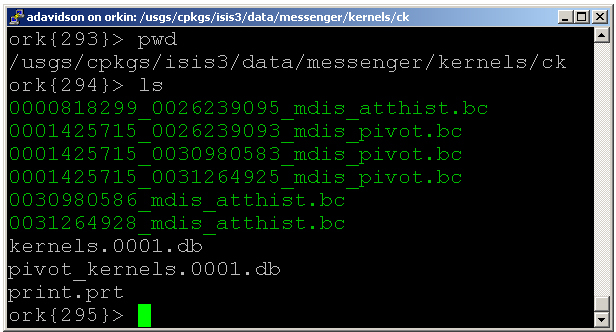 Because of this in combination with the individual needs of specific missions, ISIS arrays can be used to control kernel file order. Stuart Sides 2006-11-21 Fixed bug where spk and ck kernel files were flagged as "Predict" instead of "Predicted"
Steven Lambright 2008-08-01 Fixed bug where some ck kernels could not be loaded due to their size. Also added naif status calls, which will provide easy to read iExceptions to the user instead of a dump to the terminal window when a problem occurs. Christopher Austin 2011-05-06 Added documentation for ISIS array input. Steven Lambright 2013-02-15 Added the EXTRA option. Also, added basic support for kerneldb files being specified for SCLK/LSK parameters. Fixes #1023. Stuart Sides 2015-03-29 Added three additional decimal places to the output of the TIME keyword in output kernel database file. Fixes #2236. Christopher Combs 2018-01-11 Added STARTOFFSET and ENDOFFSET parameters to allow for slight editing to start and end times. Fixes #5272. Kristin Berry 2018-05-09 Added the LEVEL=(SEGMENT*, INTERVAL) option to specify the time coverage level to be used for the generated database. SPICE segements are made up of SPICE intervals. Segments (the only option in the past) are now the default, but interval can be selected if needed. Fixes #5410. LEVEL The level of time-granularity for the time-coverage interval to be output to the SPICE database. STARTOFFSET Seconds to subtract from each start time in the kernel. ENDOFFSET Seconds to add to each end time in the kernel. This parameter may be used as a relative pathname to specify the location of an output PVL database containing data on all of kernels matched by kerneldbgen. It should be noted that version sequences may be included in the pathname, in which case a new version will be created. The kernel type specifies what sort of information the kernel contains. Since kerneldbgen is intended for use only in situations where the most recent kernel does not eclipse the content of previous kernels, there are only two options: Spacecraft pointing kernels (CK) and Spacecraft position kernels (SPK). CK Spacecraft pointing kernels The kernels to be listed in the output database will include spacecraft pointing data. In order to properly calculate times, a spacecraft clock kernel (SCLK) and leapsecond kernel (LSK) must also be furnished via the dependency kernel group below. 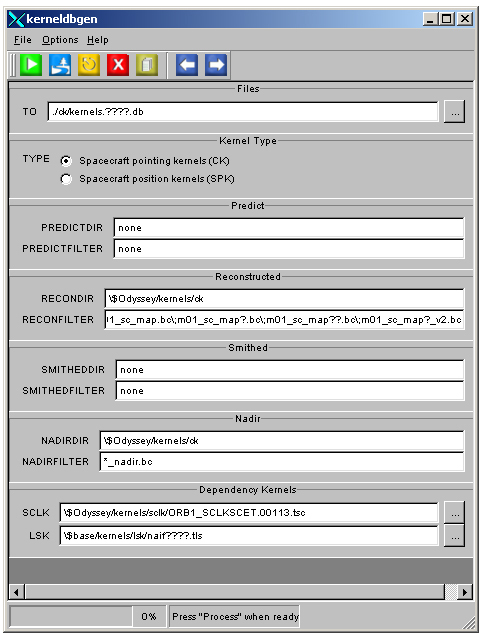 SPK Spacecraft position kernels The kernels to be listed in the output database will include spacecraft position data. Unlike calculations for pointing data, only the leapsecond kernel (LSK) needs to be provided. SEGMENT SPICE Segment The coarsest level of time granularity, a SPICE segment is composed of SPICE intervals. INTERVAL SPICE Interval A finer level of time granularity. 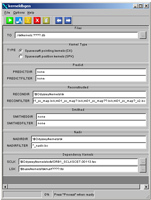 This parameter is used to specify the kernel or kernels to be identified as predicted. Any combination of kernel file names or regular expression may be specified. The value of "PREDICTDIR" is prepended to each element before being expanded. Each regular expression is evaluated then the results are sorted according to ASCII order and added to the list of available kernels. This parameter specifies the path upon which the regular expression in "RECONFILTER" will operate. Since this parameter will be used explicitly in the "File" keyword of the generated database, it is recommended that only shortcuts known to the ISIS system and absolute pathnames are used. If left as "none" no reconstructed kernels will be included in the database. This parameter is used to specify the kernel or kernels to be identified as reconstructed. Any combination of kernel file names or regular expression may be specified. The value of "RECONDIR" is prepended to each element before being expanded. Each regular expression is evaluated then the results are sorted according to ASCII order and added to the list of available kernels. This parameter is used to specify the kernel or kernels to be identified as smithed. Any combination of kernel file names or regular expression may be specified. The value of "SMITHED"DIR" is prepended to each element before being expanded. Each regular expression is evaluated then the results are sorted according to ASCII order and added to the list of available kernels. This parameter is used to specify the amount of offset (in seconds) to apply to the StartTime value for each kernel that is used to populate the db file. This value will be subtracted from the value found in the kernel. If left as 0.0, no offset will be applied, and the Time will be copied over as written in the kernel. This parameter is used to specify the amount of offset (in seconds) to apply to the EndTime value for each kernel that is used to populate the db file. This value will be added to the value found in the kernel. If left as 0.0, no offset will be applied, and the Time will be copied over as written in the kernel. This parameter specifies a spacecraft clock kernel for use in determining spacecraft pointing data. An actual kernel may be used, or a pvl file of the form kernels.??? ?.db that specifies SCLK data may be used, where ???? is the version sequence. This parameter specifies a leapsecond kernel for use in determining spacecraft data. An actual kernel may be used, or a pvl file of the form kernels.??? ?.db that specifies LSK data may be used, where ???? is the version sequence. This parameter specifies additional kernels required to fully vet the CK/SPK kernels. An actual kernel may be used, or a pvl file of the form kernels.??? ?.db that specifies LSK data may be used, where ???? is the version sequence. Use the ck option to create a database of spacecraft pointing kernels. 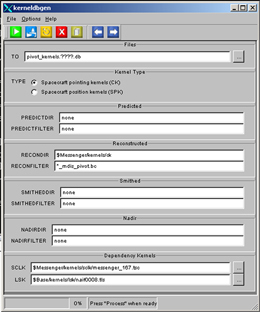 In this example, a database is being created for the pivot kernels pertaining to the Messenger spacecraft. This command line argument will create the database pivot_kernels.0002.db, assuming "0001" is the highest version in the target directory. Note the use of single quotes around the invocation of kerneldbgen. This is done because this particular run uses several characters such as the wildcard (*) that would be interpreted by the shell. 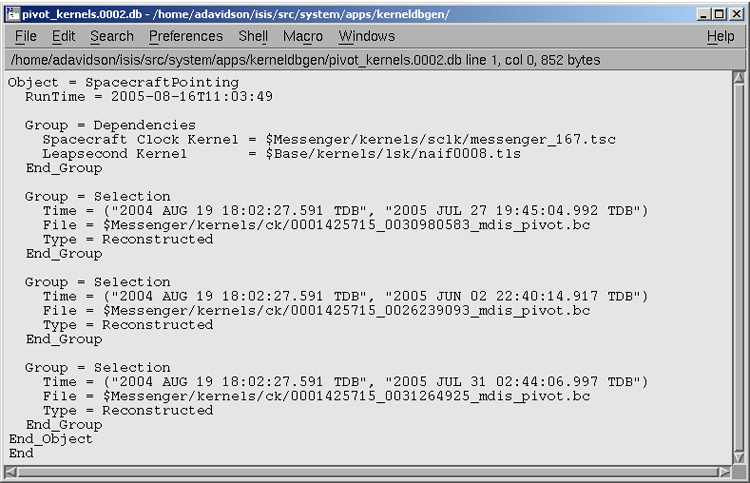 Screenshot of the GUI with parameters set to create a kernel database of Messenger pivot kernels. Unlike running from the command line, the program need not go through the shell. Consequently, the input does not need to include escape sequences or quotes. As seen in this terminal snapshot, there are a number of files that will match the reconfilter in the directory specified by the recondir. 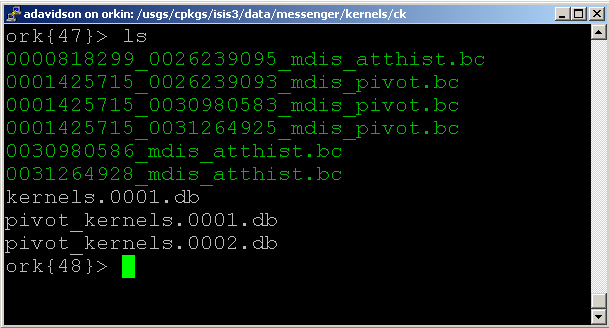 The highest pivot_kernels version is 0001. None of the original files have been altered, but the versioning system has created a new version of the pivot_kernels database named pivot_kernels.0002.db. The content of this file is listed below. As seen here, the database has picked up all of the files that match the filter specified. Each time coverage interval is listed as a selection, and the dependency kernels is listed in a "dependency" group. Note that since the only type of filter specified was for Reconstructed kernels, that is the only type of kernel to appear in the database. This command line argument will create the database kernels.0001.db, assuming that file does not already exist in the target directory. As in the previous example, the command line argument is surrounded by single quotes in order to escape characters that would otherwise be considered special by the shell. 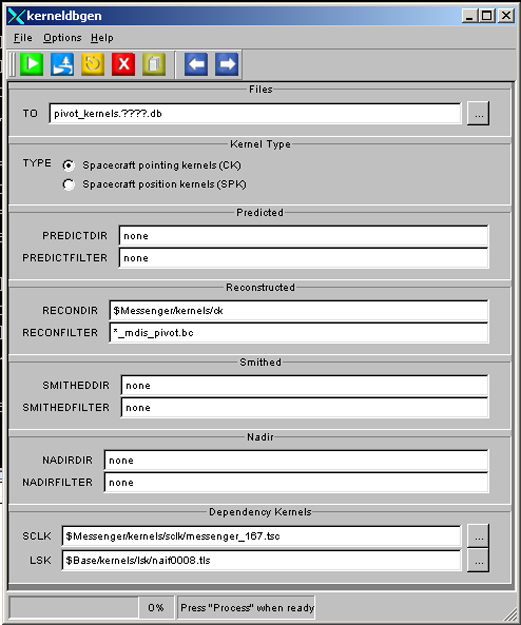 Screenshot of the GUI with parameters set to create a kernel database mixed with nadir kernels and reconstructed kernels. Here one can examine the results of the datafile. Note the ascending order of kernel quality. None of the original files have been altered, but the versioning system has created the first version of the kernel database, kernels.0001.db. The content of this file is listed as well.